"Highest Ranked Large Car in Initial Quality"
The 2017 Kia Cadenza is now available at Chantz Scott Kia. See us today to take home this shiny, new Kia for sale in Kingsport, TN. Experience the active safety systems and mobile gadgets on the 2017 Kia Cadenza Premium, Technology, and Limited models today. 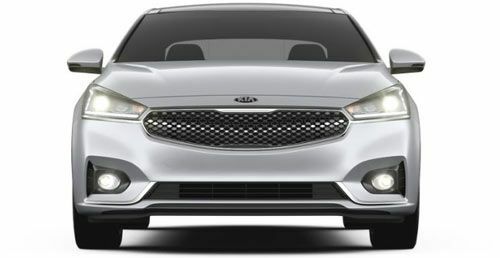 The friendly and knowledgeable sales associates we employ are eager to review the safety features, warranty options and connected media systems on our entire fleet of new Kia vehicles for sale. When you are ready to experience this vehicle for yourself, contact Chantz Scott Kia. Make the quick drive from Johnson City and test drive your next new Kia today. Regardless of the model you take home, when you climb behind the wheel of a 2017 Kia Cadenza you become in control of a 3.3 Liter, V6 engine that delivers 290 horsepower at 6,400 rpm and 253 pound-foot of torque at 5,200 rpm. When it comes to exterior styling, all three models come with Body-Color Heated Power Mirrors with LED Turn Signal Indicators, but you'll need to step up from the Premium to the Technology if you're looking for the Unique Vertical Design Front Grille, Power-Folding Outside Mirrors, and Chrome Outside Mirror Housing. The Cadenza Technology also comes with Smart Welcome and a Panoramic Sunroof with Power Sunshade. The Premium starts the Cadenza lineup with UVO eServices with 7" Touch-Screen Display, AM/FM/MP3/SiriusXM® Audio System, with Android Auto™ and Apple CarPlay™. When you upgrade to the Technology or Limited models you can enjoy Voice-Command Navigation with 8" Display. Once you drive off the lot in your next new Kia, remember our dealership when it's time to schedule your Kia service online.